The secret behind good results from a manual harvest in Northern Mexico is the jute bags which they use to transport the onions from the field. Mexico, manual harvest, and the secret of jute bags. Jute bags form an essential part of a good white onion harvest in Mexico. The Mexican white onion: large, elegant and very delicate. The secret to a successful manual harvest in Mexico is using jute bags, as you can see in the photo below. They are not only useful for collecting the harvest in the field, but they also act as small dry stores. Inside the jute bag, the onion is well protected from the sunlight and is also well ventilated, and so the recently harvested onions dry well, right down to the roots. If no rain is forecast, the onions can be left in the field for one or two days, drying out and sealing the neck of the bulb. A white onion harvest, with the onions stored in thousands of jute bags, well ventilated yet protected from the sun. If you are thinking about mechanising your onion harvest in semi-arid climates, like in many regions of Mexico, then jute bags are essential. During a mechanised harvest in temperate climates, like in the Netherlands, the onions are windrowed for a couple of days (weather permitting). If you try this in tropical climates, the sun will burn the onions. However, the onions must be dry before they can go to market. In tropical/dry semi-arid climates, a system is required for drying the onions under controlled conditions, even if your intuition tells you otherwise. How does a drying wall work? 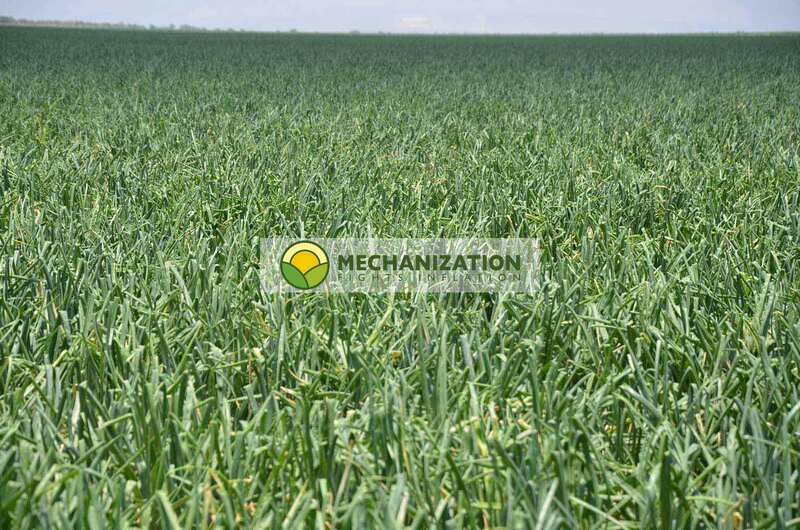 In the Netherlands, onions are windrowed during a mechanized harvest, which you cannot do in arid climates. These bags act as small stores which, despite being well ventilated, protect the onions against the burning rays of the sun. The result is a well-dried onion, ready to be sent to market.